When growing a family, be it through adoption or through pregnancy, it seems that the learning curve is the steepest the first time around. Our first time through both experiences was marked with voracious reading, lots of questions, a certain amount of insecurity, and a few fears. We relied upon the advice of those who had gone before us to help guide us as we navigated our way through each path. The second and subsequent times through seem to bring a freedom, a confidence, and an ease that wasn't there the first time. Now I can only speak for pregnancy when I say this, but this seems to also be true of my friends who have adopted a second (or more) time. They often exhibit such grace, trust and patience with the process. Being pregnant a third time with our fourth child, I feel more confidence and trust than I did either time before. I am far from being preoccupied with my pregnancy. In fact, if I'm honest, I am often so busy caring for my children, cooking, cleaning, sewing, and working, that it's sometimes easy to forget that I'm pregnant. Occasionally, I feel a little guilty about that. Because I am now keenly aware of how quickly these children grow and how fleeting the time is. I want to cherish it and soak it in as much as I can. The fact that we are starting again in terms of baby everything has given me the opportunity to sew a few things for our baby. As much as I enjoy the sewing process itself, this time has now been transformed into a meditation as I sew for this little one that I carry within. It's a step back from the busyness of the day. In those quiet evening hours when the other kids are asleep, I spend time focusing on her, daydreaming about her, wondering what she will be like, as I sew these tiny creations for her. When looking for baby sewing inspiration, I began with Anna Maria Horner's latest book, Handmade Beginnings. The first thing that caught my eye was her patchwork sleep sack. My fabric stash has grown but with my kids growing as they are, I seldom have the chance to use these smaller pieces. This was the perfect scrap buster. So, I made this sleep sack first. As Anna Maria suggested, I added a few traditional quilting details by making hand-quilting stitches around the armholes and along the inner side of the binding. I chose to use a larger stitch with contrasting thread for more of an embroidered look. 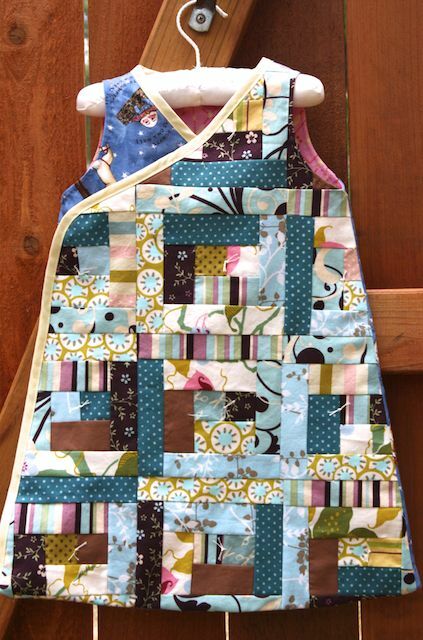 This was my first attempt at hand quilting and I followed this tutorial. Keeping several stitches on the needle at once worked well in creating straight, even stitches. It was much easier than going stitch by stitch. 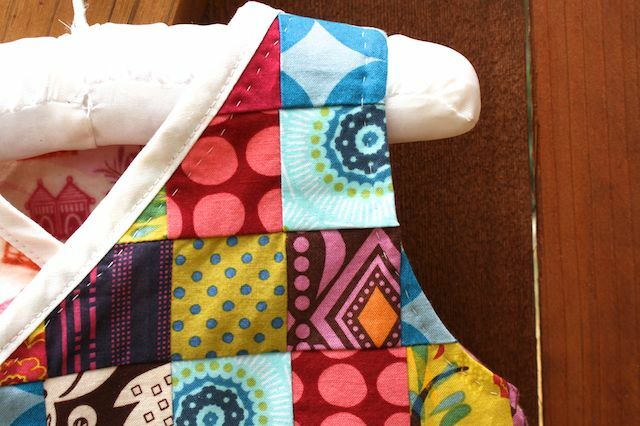 When I was about halfway done cutting the squares for the patchwork of this first sleep sack, I remembered that I had over a dozen log cabin blocks that I had pieced a couple of years ago. I had planned to use them in a quilt for my friend who had generously donated hundreds of ounces of breast milk for Evie. 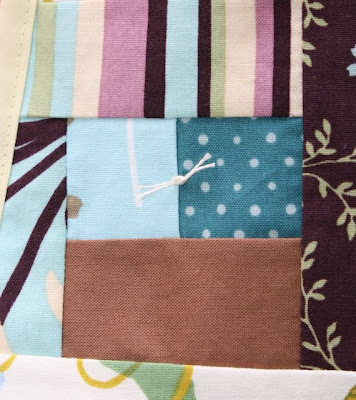 But I didn't feel that these blocks quite suited her and went a different direction with her quilt. The blocks felt just right for this project. The blocks had a vintage feel to me so I matched them with this vintage-y nursery rhythm fabric that I had on my shelf. 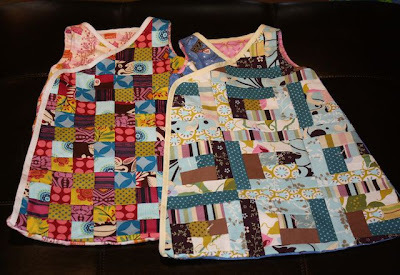 I again used hand quilting stitches around the armholes. Rather than adding more hand stitching to this sleep sack, I decided to tie the quilt blocks using embroidery floss. There's something about a tied quilt that reminds me so much my grandmother's house. 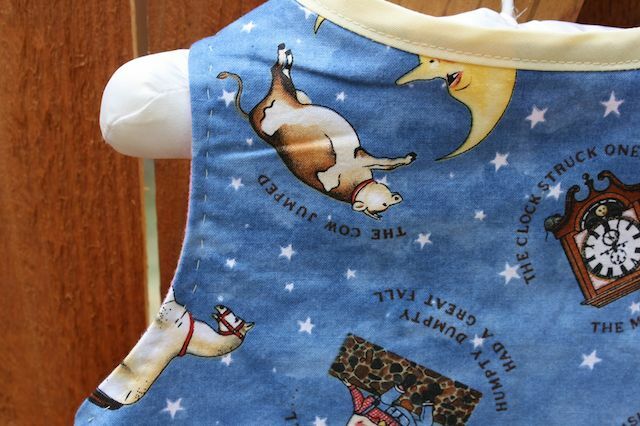 So warm and inviting - and I felt it kept with the overall vintage feel of this sleep sack. This was my first time tying a quilt and it was even easier than I imagined. I followed these tutorials. Both of the sleep sacks are fully lined with Anna Maria's flannel. It was the only fabric I needed to purchase for this project. 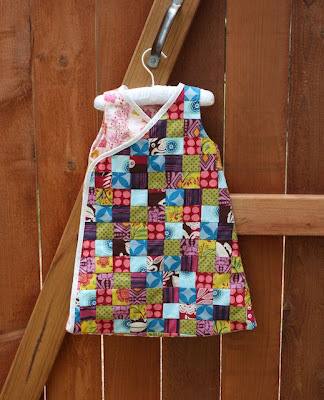 The rest of the fabrics came from my scrap pile. The pattern instructions for this project were phenomenal - par for the course for Anna Maria Horner. The only place that I deviated from the pattern was in applying the velcro. I waited to baste and serge the bottom of the sleep sacks until the end of the project so I could sew the velcro onto the lining only. This way my stitches would not show through to the front of the sleep sack. I also used store bought bias tape rather than making my own. (Amy Karol of Angry Chicken has this fantastic tutorial on how to apply bias tape without swearing). This is our daughter's handmade beginning. They are both beautiful and I know you will get lots of use out of them! Best wishes for continued peaceful sewing and a healthy baby soon! Love to be a part of the preparations for her arrival... even if from afar. It's quite inspiring! these are amazing! And... a comment from AMH herself? Awesome! Enjoy your sewing for baby! Your sleep sack looks fabulous! I still have a lot of work to go before I'm good with patchwork - even simple designs - so I'm very impressed with your impeccable work. Lovely!